Do you have a special Birthday coming up? Perhaps you have a loved one’s Birthday approaching and you want to make it extra special? 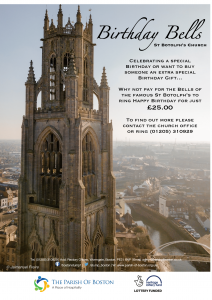 For just £25.00 you can have the iconic St Botolph’s tower ring Happy Birthday across the town of Boston! Along with the bells, you will also be able to put posters up on our noticeboards to let people know who they are ringing loud for. To find out more information or to book the bells* please contact chris.ladner@parishofboston.co.uk or call (01205) 310929. * please note that there are certain restrictions as to when the bells can be played, please contact the Parish Office if you require further information. Due to the ongoing restoration and reordering works at St Botolph’s we will be unable to now take any Birthday Bell bookings until January 2020. If you would like to mark someones special day, perhaps think about lighting the tower for £30.00. To find out more please see here.